Here is my wish to your daughter, a few lines from me. So sweet, and your fairy so pink!! 😀 So, did your daughter like the poem? My daughter was a very pink fairy. 🙂 Alas, she is much prettier than my skill at painting could manage. My daughter loved the poem and took it for granted that someone would write her a cool poem, since I am always doing that for her. I know how special it is, though, and I appreciate Line very much. I thought so, too. 🙂 Thanks for commenting! How sweet! A wonderful birthday gift to your daughter. I love Line’s poems, and it seems she just put this 1 together with such ease. Amazing how we all inspire each other here in blogland. I imagine your daughter is very pleased at the birthday that just keeps giving! Thanks, yes, Line is terrific. I love how WordPress provides up a forum for us all. It’s rewarding. It’s nice, and it’s great you’re pursuing something which you think is important for your fairy tales and the book. Definitely, good start. That’s nice. But the professor wants to be a Leprechaun! Oh, for a pot of gold! So sweet….Happy 5th birthday to your daughter!! As a lover of fairy tales I thank you for posting this gem. Loved the image as well. I enjoy reading your blog and have nominated you for The Shauny Award. (If you can squeeze it in. )Further details about the award and image can be found on http://decidinglybob.wordpress.com/ maria’s stuff page / sub heading shauny award. Oh, Brenda! 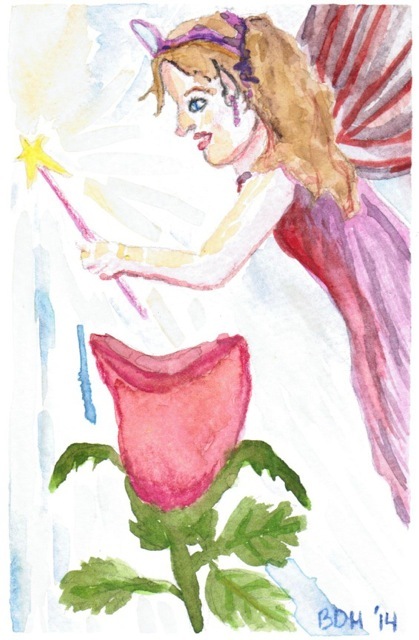 The fairy you painted is so beautiful!! I love it!! You should illustrate more, you are really talented!! 🙂 She reminds me of you 🙂 Hihi, just as sweet! 🙂 I had fun painting with my daughter. Thanks! She is fabulous!! I hope that her magic returns to her tenfold and embraces her always. I love poetry and i love Line.. she is awesome, so are you.. but your kid.. she has to be awesome-r I know that’s not a word but I just like to say like that..
How gorgeous and what a lovely gift that poem is.